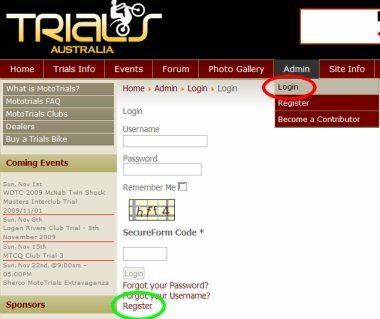 There are two different login systems on Trials Australia, one for forums and one for article comments. The most common problem is trying to login to one system with the credentials of the other. You can register the same userid and password for each system, but you will need to register twice, once in each system, to use both systems. How to login is shown in the pictures below, circled in red. 2) the forums, accessed via menu bar >Forum > then login from link on the right hand side. They are different, unconnected systems. To leave comments on news articles you need option 1. To post replies or create classified ads in the Forums you need option 2. By all means register in BOTH systems, using the same userid and password. The register links are shown circled in green in the pictures above.